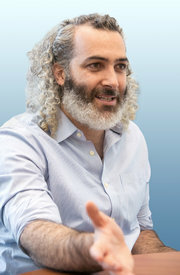 Adam Bryant conducts interviews of senior-level executives that appear in his “Corner Office” column each week in the SundayBusiness section of The New York Times. Here are a few insights provided during an interview of Aaron Bell, C.E.O. of AdRoll, an online advertising placement firm. To read the complete interview, check out other articles, and obtain subscription information, please click here. I grew up near Seattle in Bellevue, and I was a precocious, nerdy kid drawn to computers at an early age. I started playing around with programs and creating my own games. Eventually my neighbor took notice of me. He had a software company, and they developed Christmas software, with screen savers and games. So I was a Jewish boy creating a Santa’s workshop and games where you fly reindeer around. I loved it. My dad would pick me up after middle school and drive me to work in Redmond nearby. In a bit of serendipity, Microsoft was two blocks down the street. And they were hungry for engineers, gobbling up talent whenever they could find it. They started pulling people from my neighbor’s company to work for Microsoft. And as more people left, I took on more responsibility at this software company. Pretty soon, I was leading the Christmas software project. I was 14 years old. I had a baby sister, so I said, “I would put my baby sister in the refrigerator and then pull her out and check the dilation of her eyes.” They said, “That’s morbid, but it’s pretty clever,” and they hired me. I spent about six years at Microsoft. I was able to work it out with my high school where classes would end at noon for me and then I’d go to Microsoft and try to stay within the labor laws for hours worked. During the summers, I would transition to intern and take advantage of those programs. I did manage to spend some time with Bill Gates. Every summer he would have a barbecue for the interns. After being there for so many summers, I figured out the pattern. He would come out of his house and go right to the dinner line. So I would wait by the door, and when he came out, I’d get in the dinner line with him. That way, I’d get to sit next to him, too. Tell me about the culture of your company now. I have this overall philosophy that a company is like a human body, which builds up toxins over time. Every company has problems and issues that build up, and you need to find outlets for those things. I think a lot about how you come up with different practices in the company that are a kind of cleanse. So we do a weekly all-hands meeting, and it’s a weekly flush to get the toxins out. Before our all-hands meetings, I send out an email with a question-and-answer board and I encourage people to post their questions. You can vote up your favorite questions, and they’re anonymous. If you give someone a mask, they’ll tell you the truth. I also encourage people to post their fears, their uncertainties and doubts. And there’s a guarantee that any question that is asked will get answered or addressed by me, unless they are personal in nature about someone in particular. The alternative, if you don’t do that, is that you have people behind closed doors chatting about the company, gossiping, saying negative things. If you address everything, people feel much more trust. They feel like they know what’s happening. And they’re going to make better decisions because they know what’s going on.